property description: Whether you call it ECO, EARTH FRIENDLY, GREEN, ENVIRONMENTALLY RESPONSIBLE, ETHICAL, ALTERNATIVE, VEGETARIAN OR ORGANIC, Bunk House at Zion Bed and Breakfast is a simple, cozy retreat nestled within the canyon walls of Zion in the Virgin River Valley. 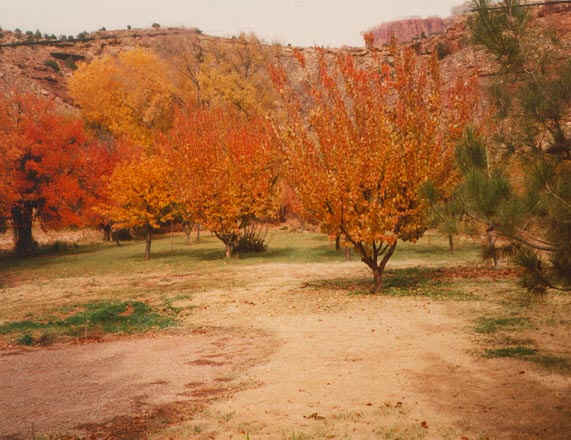 Surrounded by orchards, pastures, gardens and majestic red cliffs, our home offers a quiet, peaceful atmosphere and a low-impact consciousness. We are 10 minutes from ZION NATIONAL PARK and 2 1/2 hours from Las Vegas, in Southwestern Utah, which is a part of the Colorado plateau, and along the Grand Circle tour of Utah National Parks. Bryce Canyon and Grand Staircase Escalante National Monument are within 2 - 3 hour drive from us. If you enjoy rural touring, there are many backcountry roads all around us. Come and REST, RELAX, and RECHARGE while we REDUCE, REUSE & RECYCLE. Glass, paperboard, junk mail, office paper, other aluminum and mixed plastics that we used to have to drive to Las Vegas ourselves are being picked up by a new local recycling service. We have recarpeted with PET recyled pop bottle carpet and pad. Over 30% of our power is purchased from CLEAN RENEWABLE wind POWER. We SERVE our own ORGANIC fruit, jams, granola, yogurt and baked goods. We are "low-impact"; dedicated to conservation, recycling, co-ops, credit unions, organic growing, and sustainability. Evenings you may find us drying or bottling our organic fruit, shelling nuts, or even darning socks! 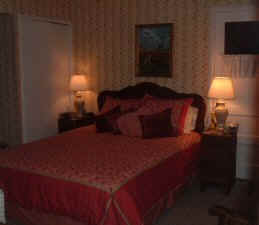 accommodation: We have 2 rooms, the Country Room and the Southwest Room. Both rooms have a queen size bed. 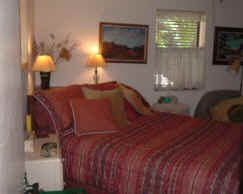 ROOM RATES: High season:$55-$80/night double occupancy. High Season is from the Easter Holiday through the Columbus Day Holiday in October. Off season DISCOUNT: $45-$75. 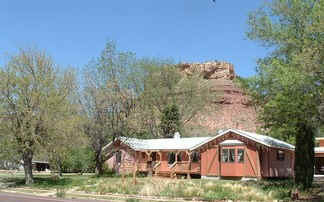 Bunk House at Zion is located in the heart of Color Country. Listed below are many area attractions within a 1-2 hour drive. Zion Canyon is home to a thriving artist community featuring works by composers, potters, painters, photographers, sculptors and writers. Many of their works can be found in area shops. Zion Natural History Association - Zion Canyon Field Institute--seminars on various aspects of Zion National Park and the desert southwest. Zion Canyon Giant Screen Theatre - showing "Zion Canyon Treasure of the Gods" and other large format films. Large screen format 6 stories high and 80 feet wide with Dolby surround and DTS sound. The large screen shows the beauty, adventure and magic of Zion National Park. The 40 minute film takes you through terrifying flash floods and on rock climbing expeditions where you'll hang from your fingertips 2,000 feet above the earth. A live show and recent Hollywood movies are presented in the evenings. For tickets and information call (435) 772-2400. Zion Factory Stores located in the town of St. George 45 minutes away. Silver Reef Ghost Town located off I15, a quick 45 minutes drive. Coral Pink Sand Dunes State Park - 1 hour. Off Highway Vehicles allowed in some parts of park. Coral Pink Sand Dunes is the perfect name for this state park, located off US 89. Open all year, the park is a wide-sweeping expanse of coral-colored sand, drifted into dunes just begging to be climbed. Cedar Breaks National Monument - 1 1/2 hours. Carved into the western edge of the 10,400 foot-high Markaqunt Plateau is an amphitheater of colorful spires and columns. It plunges 2,500 feet deep as it scoops away three miles of the green alpine meadows, revealing various shades of red, purple and yellow rib-boned through the eroded limestone. Kodachrome Basin - Part of the Grand Staircase Escalante National Monument - 2 hours. Unique spires and chimneys called sand pipe intrusions jut up from the valley floor creating a surrealistic setting. Their colors change during the day and they seem to glow at sunrise and sunset. The Bunk House has 2 rooms, the Country Room and the Southwest Room. Rooms may be reserved with a private bath or a shared bathroom. Room Rates: High season: $55-$80/night. High Season is from the Easter Holiday through the Columbus Day Holiday in October.